S/V Rutea Sails Around the World: Olsem Wanem? Now that we have Fiji almost 500 miles to the east and our anchor firmly planted in Anelghowhat Bay, I realize what an aberration our cruising season has been this past year. 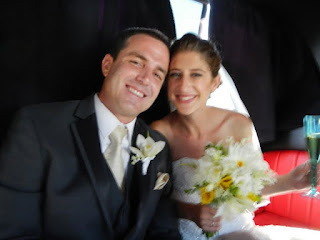 Instead of seeking out remote villages and tropical anchorages, we spent a fabulous four months in Southern California, celebrating our daughter, Caity, and her husband, Danny. who got married on July 28. The entire affair was fantastic, from the planning and preparation to the wedding itself and the wonderful events (and meals) that took place days and even weeks after. 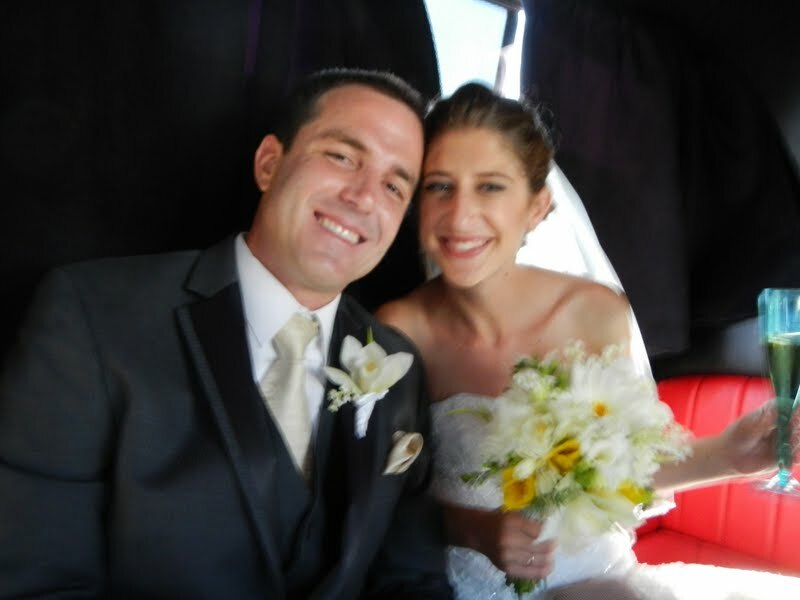 The photos show a very happy couple and the smiles on everyone's faces are confirmation that it was a great occasion. We couldn't be more proud . 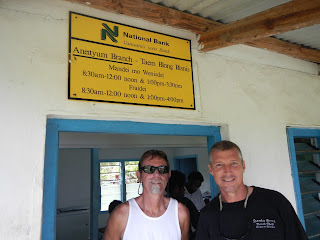 . .
Now we're in Anelghowhat Bay on Anatom Island, the furthest south in the Vanuatu archipelago. 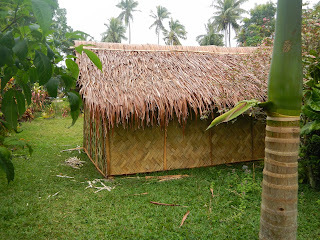 The small village here is populated with about 900 Ni-Vanuatu (that's how you refer to the people of Vanuatu) and their homes are very simple one-room thatched huts. The only building that resembles something more modern is the branch of the National Bank of Vanuatu and it's probably not 12-feet long and about 8-feet wide but it does have a tin roof. It's open on Mondays, Wednesday and Fridays. They speak Bislama here but many people also know French and English. In case you were wondering, Olsem wanen is asking 'How are you?' whereas to say good-bye you say 'Bae/mi likem yu.' So far, everyone has been very friendly. Rutea has been doing exceptionally well. True, her transom is in bad need of cleaning (she gets a dirty bum if we motor for too long) but all of her systems are working as they should. Our plan is to stay here for a few more days and then head to the next island north, Tanna, where there's an active volcano that you can hike right up to its edge and see the fountains of lava. 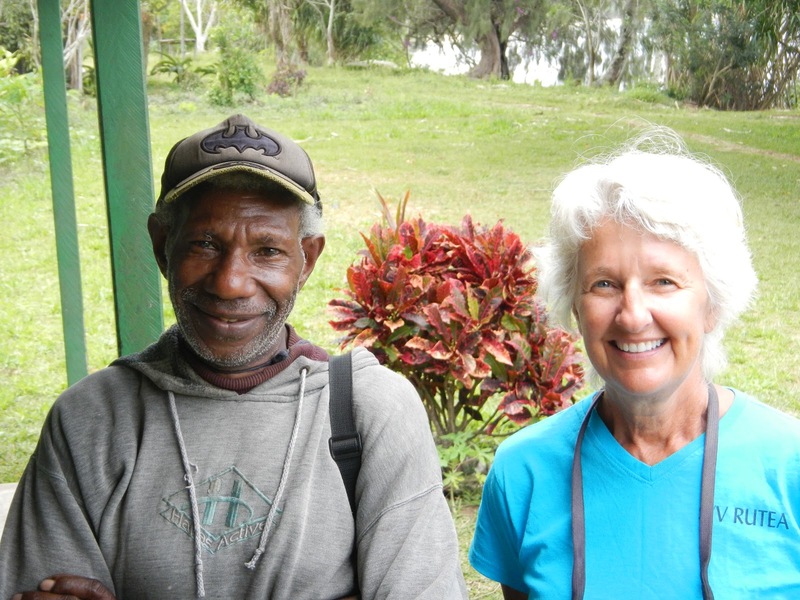 From there we'll continue north and probably stop at Port Vila, which is the capital and a good place to provision. We've heard that the best islands for cruising are still north of that but we only have 30-day visas and we want to see New Caledonia before we head to Australia. Cyclone season starts on November 1 so we want to be someplace safe not too long after that. Once we get to someplace with internet service I'll try to post some pictures. Right now we're using our satellite phone to post these reports. The adventure continues . . .